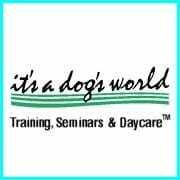 Created with your canine best friend in mind, it’s a dog’s world is the largest “all positive” dog daycare, canine training and activity center in the seacoast area. Nestled on 7 acres of open countryside, we are conveniently located to York, ME beaches, the Kittery, ME shopping outlet malls and historic downtown Portsmouth, NH. We invite you to browse through our site to learn more about our many courses, daycare program, events, and all that our training and activity center has to offer. ​See how we’ve been "delivering positive results for you and your dog since 1998! "™.